The thing about Tyvek® is that it has so many uses. Every day we think of new ideas for which Tyvek® might be used. We started with our tote bags which have been our most successful lines. We then added light luggage such as our travel/gym bags and backpacks. Later came umbrellas and clutch bags and we have a whole list of new products to add to the range such as clothing, shoes, hats and many other things. One of our most successful lines has been our Tyvek® iPad cases. We have two designs. The first is just like a brown padded envelope. It has two advantages. First, it is easy to open to access your iPad since it has a flap like any envelope. It also has a Velcro strip and snap button fastening for security. And second one is it looks just like a paper envelope and it keeps your iPad safe from sight. Our second design is iPad shaped with a zip fastening at one end. This version is available in brown Tyvek® looking like brown paper and this version is available with a brown zip or a pink zip. It is also available in our very successful newspaper print design. This version is available with a black zip or with a contrasting red zip. 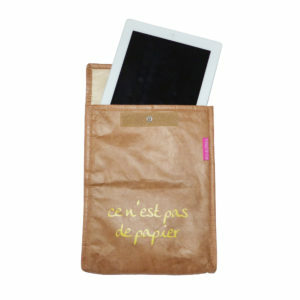 BO-BORSA Tyvek® iPad cases are very original and distinctive. They are strong and padded and will protect your tablet against spills of water, oil or grease. 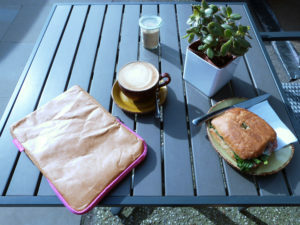 If you want to carry and protect your iPad or tablet in a case that will be noticed please take a look at our website.